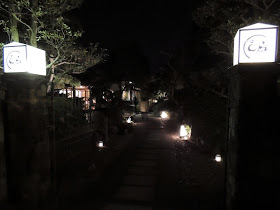 Kittei 「吉庭」 is a Japanese-French fusion restaurant, which resides in a converted old traditional house in Sawara, Katori City. Its dining area overlooks their beautifully landscaped gardens. I was there for dinner and it was rather dimly lit outside so I couldn’t really appreciate the exterior of the building and the gardens. It’s interesting that the restaurant serves dishes based on seasonal ingredients. Prior arrangements had already been made for our dinner so I don’t know what the exact names of the dishes (which we had) are on the restaurant’s menu. Kinoko (i.e. mushroom) Cream Soup – This felt like one of those cappuccino soups which has a smooth texture and is a little frothy at the top. It was aromatic and the pleasant flavour of the mushrooms lingers on your tastebuds with every spoonful. Sautéed Snapper with Edamame in Asari Clam Soup – I was pleasantly surprised to find 3 clams hidden under the slice of fish and the edamame (枝豆, soybeans) gave a different dimension to the flavours of this dish. The soup was light and tasty and I consumed every bit of it! Pork with mustard sauce, potato, roasted garlic, bacon and french beans – The meat was extremely tender and the accompanying side dishes went well with it. I don’t like garlic and donated my share to the person seated next to me, who absolutely loved it! Soba – Didn’t quite expect to eat Japanese soba at this stage of the meal! The soba with seaweed was served piping hot but I felt the dipping sauce (or was it soup?) was too salty for my liking!! Dessert – The chocolate cake had coffee powder sprinkled on top and tasted a little like tiramisu but it was more like cake than tiramisu (if you know what I mean). This was accompanied by a scoop of strawberry sorbet and single slices of pineapple, grapefruit and a grape. Overall, it was quite a nice meal and was rather filling! Address: i-789-2, Sawara, Katori City, Chiba Prefecture 287-0003.